This Chocolate Cake Recipe is seriously a chocolate lover’s dream! The combination of Chocolate Ganache and Buttercream Frosting make the perfect pair for this recipe. You’ll definitely be sneaking late night slices of this fluffy chocolate cake! There is something romantic about dark, bittersweet chocolate and espresso, am I right? Or maybe it’s my love affair with the two? Either way, the rich and velvety combination of these flavors are what I crave most. 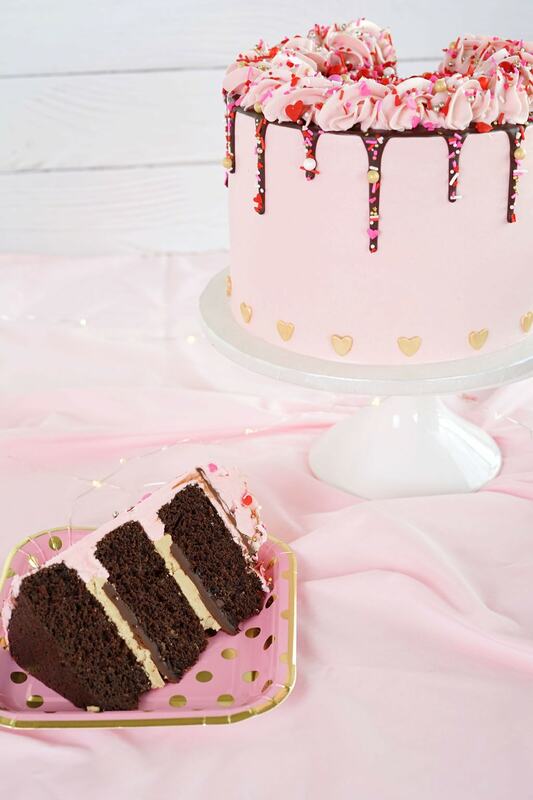 This cake is brought to you by our amazing contributor Ashley Twilley, and what a more perfect time to bake this chocolate-y cake than for Valentine’s Day! Get your forks ready because you won’t want to put this cake down. One thing I love about this chocolate cake recipe is the fact that it only requires one bowl! Yep, you read that right — one bowl. And with that comes super easy clean up and more time for you to eat cake! ;) In that bowl with a whisk attachment, combine all dry ingredients. Then add in all wet ingredients and mix on low-medium until there are no large clumps. Finally, bake for 30 minutes at 350 degrees. So simple! This Chocolate Ganache is SO simple and only takes two ingredients to make! Add your bittersweet chocolate chips to a mixing bowl and set aside. On medium heat, heat up heavy cream in a saucepan and wait until it just starts to boil around the edges. Slowly add the heavy cream to the chocolate and let sit for about 5 minutes then whisk together until smooth. You’ll want it to be the consistency of peanut butter for the cake filling, so leave it in the refrigerator or at room temperature. This buttercream is filled with so much flavor and pairs perfectly with the chocolate ganache filling. Combine instant coffee with water in a small bowl until dissolved. In a separate bowl, beat butter on medium-high for 3 to 5 minutes using a paddle attachment until smooth. Slow the speed down to low-medium and slowly add in coffee and vanilla mixing for another 2 to 5 minutes. Reduce the speed to low and slowly add in heavy cream, salt, and powdered sugar (one cup at a time). Continue beating for 5 minutes on medium speed until light and fluffy. 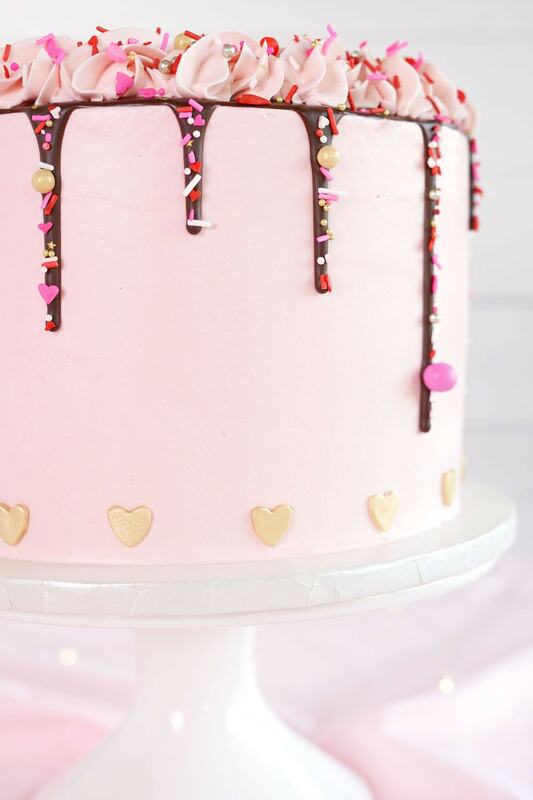 I am seriously in love with the flavors of this amazing cake recipe! You all know that I have a mild sweet tooth (ha! ), so this dark chocolate and espresso combination is right up my alley! 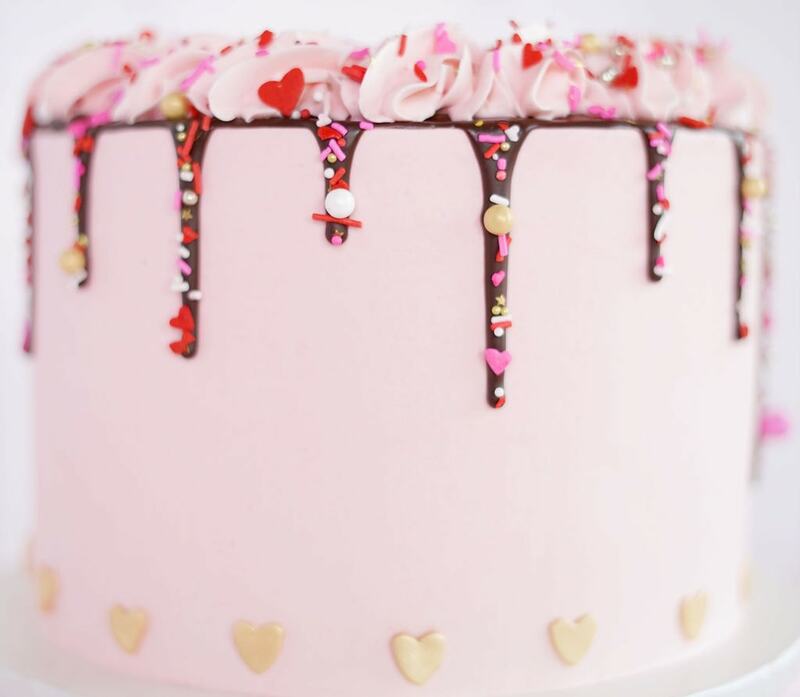 ;) For the sake of Valentine’s Day, we used the Swiss Meringue Buttercream to ice the outside with a perfect shade of pink. If you aren’t set on a specific color and want more of that amazing espresso buttercream just double the recipe! I could seriously eat this buttercream by itself with a spoon for breakfast, lunch, and dinner! 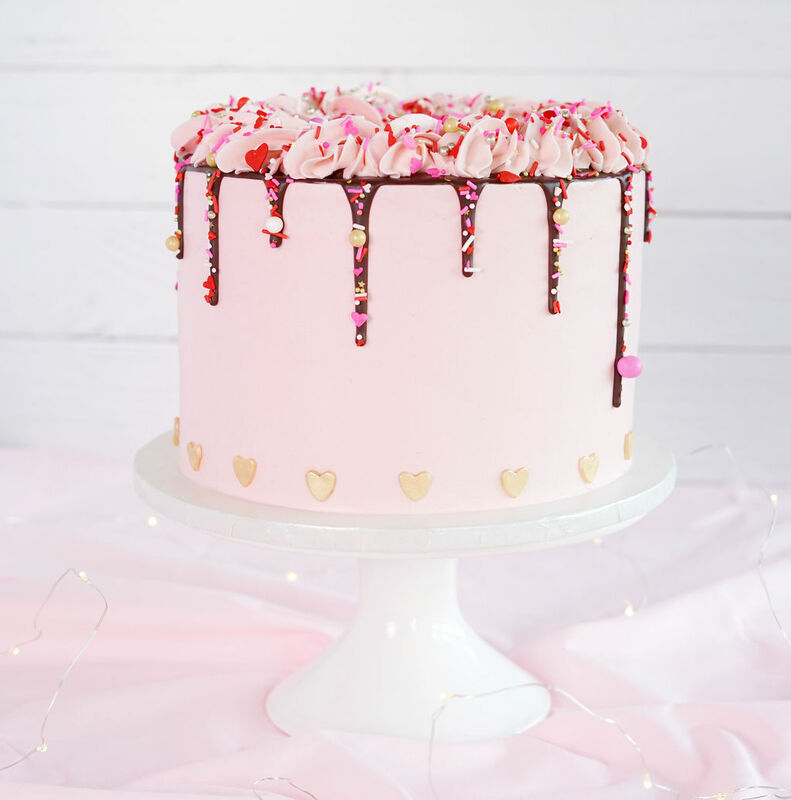 This cake has the perfect number of sprinkles and pink on the outside to match the amazing burst of flavor on the inside! In order to keep the ganache from spilling out the sides of your cake, lay a layer of buttercream first then pipe a border of more buttercream around the edge. Then you can lay a layer of ganache without it making a huge mess! 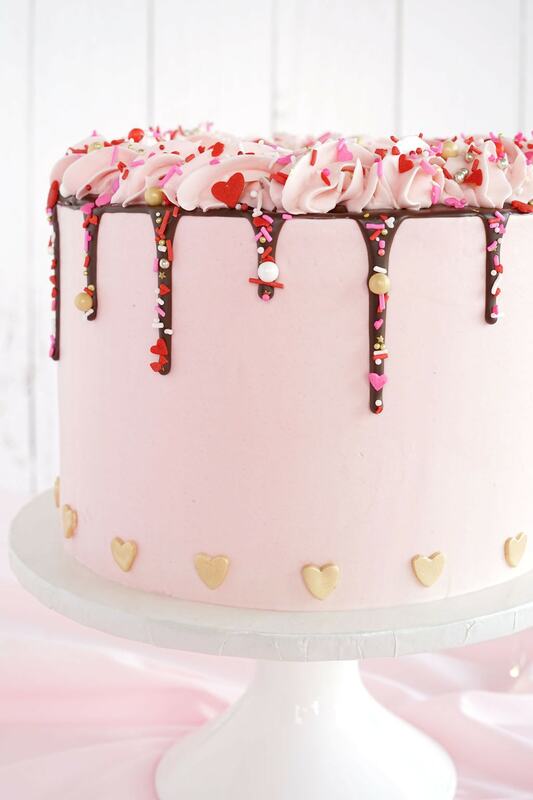 You can use the rest of the ganache to create the drip decoration on the top of the cake. Now you can feel like even more of a pro when you show your friends the amazing cake you created. This chocolate cake recipe is a serious contender for my top favorite! I mean, it has two of my favorite things — cake and coffee! 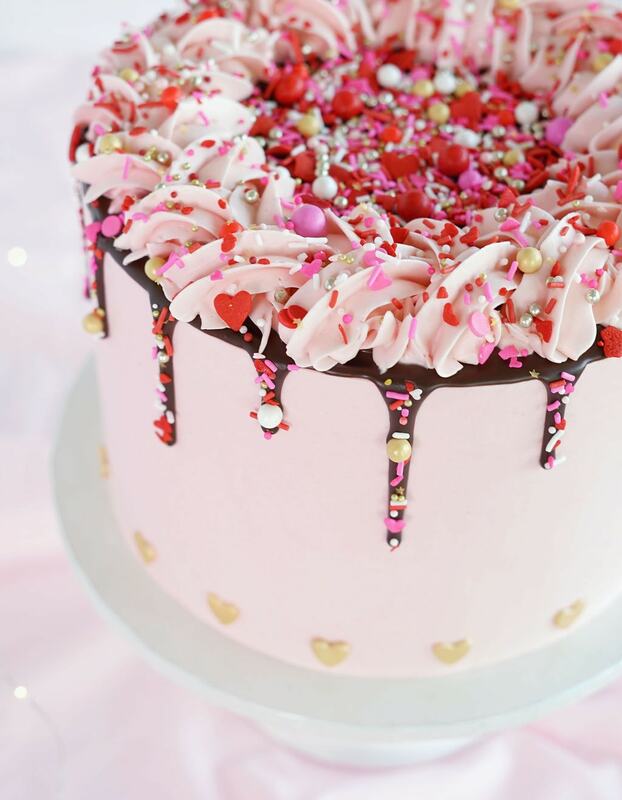 If you use this cake recipe for your next Galentine’s Day party, I would love to see how you all decide to decorate your cakes. Let me know in the comments if you prefer the espresso or swiss meringue buttercream on the outside. If anyone needs me, I’ll be indulging on another piece of this incredible cake! 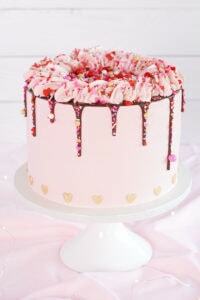 How many cups of the pink Swiss meringue buttercream is needed for this cake? I did not fill the cake with the SMBC, I just used it for the outside. One batch is enough for the outside and you’ll have leftovers! Also, please provide a recipe and instructions for the chocolate drip?